Neil Robertson said he is a better player now than he was when he won snooker’s World title after beating Judd Trump 4-1 in the final of Players Tour Championship event eight in Ireland. It was the Australian’s second PTC title of the season having won PTC6 in Poland three weeks ago. The left-hander conceded just six frames in the seven matches he won at the Killarney Convention Centre, finishing with a comfortable victory over Trump. A scrappy first frame went to Robertson on the colours, then Trump levelled in the second with a top break of 39. Robertson knocked in a 76 to regain the lead and stole the crucial fourth frame by potting the final blue and pink. And a calm 65 in the next saw him clinch the 10,000 Euro top prize. 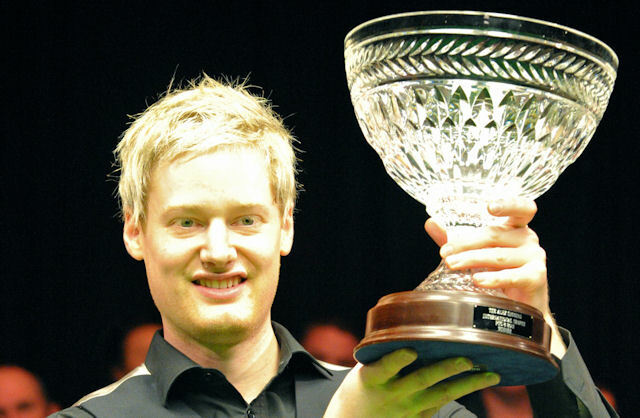 “It wasn’t the best final but my safety was good and I did what I needed to,” said Robertson, who won the Betfred.com World Championship in 2010. “Up until the final I played really well. Last season I was crashing out in the first or second round of most of the PTC events so it’s great to have won a couple now. My form is looking good with the UK Championship and the Masters coming up. The PTC is a series of 12 short events, with the top 24 on the final Order of Merit going through to the Grand Final in March, providing they have played in at least three domestic events and three overseas. The next tournament is PTC9 in Antwerp, Belgium, from November 10-13.